Cryptozoic also unveiled a multitude of Hobbit deckbuilder goodness, as well as Bravest Warriors and Naruto Shippuden games. 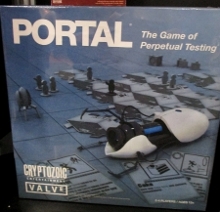 Cryptozoic has announced that they'll be producing a Portal board game this year designed by the same folks as the video games. Contrary to most other Cryptozoic games, Portal: Uncooperative Cake Acquisition Game - which the company calls a working title - will include a large amount of tiles and miniatures. Including tiny portal turrets, test subjects, weighted companion cubes, and cake. The release date is apparently Q3 2014, with no description of play provided other than that it's "based on the Puzzler-based video games that deliver a rich, smart, and utterly unique narrative experience"
The other highlights are Walking Dead and Bravest Warriors dice games, which if we can judge by Cryptozoic's previous efforts will have both lots of pretty custom dice and a fast play style that nearly anyone can learn and enjoy. Those are billed for August and June respectively. Otherwise, Cryptozoic continues to be the absolute master of licensed games, releasing an Assassin's Creed game this month, and billing expansions to their DC Comics and The Hobbit deckbuilders for later in the year.